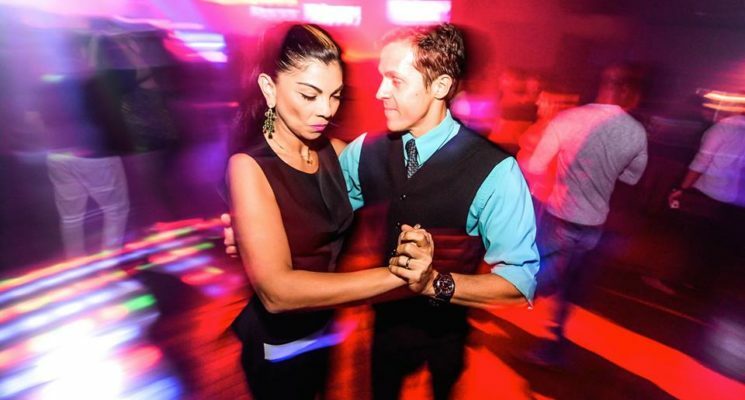 Bachata Classes & Merengue Classes - 2 in 1 Club Latin Dances Combo. with Merengue & Bachata Classes! REGISTER in Advance and RESERVE your spot! Click Here! and follow the instructions to Sign – in. This course is designed for students with little or no Bachata/Merengue dance experience. This class will teach basic fundamentals of timing, rhythm, footwork and an introduction to partner dancing helping you build a SOLID Merengue/Bachata foundation. Our goal will be to raise your awareness of timing, technique & basic body movements so you can dance the night away in no time. Originated from the Dominican Republic where the music was also born. The original, slow style in the ’60s was danced only in closed position, like the bolero, often in close embrace. The bachata basic steps is done by moving within a small square (side, side, forward and side, side, back) and is inspired from the bolero step but evolved to including a tap and also syncopation (steps in between the beats) depending on the dynamics of the music being played. The hand placement can vary according to the position of the dances, which can range from very close to open to completely open. It is increasingly danced to faster music, adding more footwork, simple turns and rhythmic free-styling and with alternation between close (romantic) and open position. Authentic bachata is danced with soft hip movements and a tap or syncopation (1, 2, 3, tap/syncopation). It can also be danced with or without bouncing (moving the body up on the beats and down again in between the beats by adding slight spring to ones legs). Authentic bachata was created by Dominican social dancers over the course of decades (starting around the beginning of the 1960s) and is still evolving to this day. In 2005 it’s popularity in the latin clubs start to bring other influences to it such as salsa, tango, zouk-lambada (Brazilian zouk), ballroom etc. If you go to a Salsa club, it is a must know how -to-dance. 30 to 50% of the music will be Bachata. Originally from the Dominican Republic. Partners hold each other in a closed position. The leader holds the follower’s waist with the leader’s right hand, while holding the follower’s right hand with the leader’s left hand at the follower’s eye level. Partners bend their knees slightly left and right, thus making the hips move left and right. The hips of the leader and follower move in the same direction throughout the song. Partners may walk sideways or circle each other, in small steps. They can switch to an open position and do separate turns without letting go each other’s hands or releasing one hand. During these turns they may twist and tie their handhold into intricate pretzels. Other choreographies are possible. It is one of the easiest Latin dances to learn due to the steady timing of its figures. We are a school of Dance, with progressive and effective Merengue/Bachata Classes. Here you will learn Bachata & Merengue faster. The Lessons in clubs and restaurants do not have continuity and, or consistency and make it really difficult to learn. Every time you go, the lessons has nothing or very little to do with the previous Merengue/Bachata Lesson. The information is not organized, the quality of instruction is not the best, and the students attending change. If you would like to learn Merengue/Bachata faster, our private lessons will get you moving well at little time. Forever Dancing Ballroom Merengue/Bachata Group Classes program is the best progressive program in the DC, VA, MD Area. We make learning Bachata & Merengue easy, quick and fun!You will always meet new people at our Merengue & Bachata classes and in doing so you may build new life long friendships! Sign up now and learn this phenomenal dance. Click here! Forever Dancing Merengue & Bachata Classes near Lincolnia, VA; Jefferson, VA; Falls Church, VA; Annandale, VA; Arlington, VA; North Springfield, VA; Franconia, VA; Idylwood, VA; Springfield, VA; Alexandria, VA; Groveton, VA; Washington, DC; Tysons Corner, VA; West Springfield, VA; Vienna, VA; with the best Merengue & Bachata Instructors of the DC Metropolitan Area.